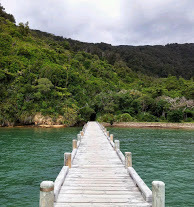 To the tune of cicadas and birdsong, we walked the 70kms of Queen Charlotte Track from 1st to 5th February 2014. We flew from Wellington to Picton with Sounds Air, who also transferred us from the aerodrome to town (for a $7 fee each way) on the Saturday morning in good time to catch our 10am boat. We hopped onboard a Cougar Line boat in Picton, with our back packs, for the hour long sailing to the start of the Track at Ship Cove. However, our back packs stayed on board as we were taking advantage of the pack carrying service Cougar Line, as well as other carriers, provide ($105 per person & pack). Yup, we were flash-packing. As we cruised through Queen Charlotte Sound the distance we intended to walk struck me, as I really had no comprehension how far 70kms really was! I have ‘bagged Munros’ (a Munro is a mountain over 3000ft in height) in Scotland, so I am fine about hill walking although these would normally be day trips. We knew we’d arrive at Ship Cove around 11am, so the initial suggestion of just walking to Resolution Bay (4.5k walk) didn’t wash with us. We decided we would continue on to Endeavour Inlet, a total distance of around 15km, with peaks of around 200+ meters along the way. We immediately discovered that the start of each stretch of Track seems to involve an immediate, relatively steep incline so my heart got racing pretty fast, but then I am not the fittest! On our side was this stretch being nicely shaded by forest trees, providing shelter from the sun. By the time we reached our first night’s accommodation legs and feet were feeling in need of a rest. However, the pretty views of Queen Charlotte Sound and various bays along the way, as well as the amusing persistence of Weka (native New Zealand, wingless bird) in trying to get fed, kept us going. Fortunately, we’d planned to have a rest day after the Punga Cove to Portage (or Camp Bay to Torea Saddle) stretch of 24.5km the following day, and this turned out to be a wise plan. This is the long day, the hardest day. This is another start from the bottom and head straight up to the top of the hill at a 45 degree angle walk. Initially we had shade of pine forest on our side. However, even in shade it was warm. Then it got hot, it got sunny, at times it felt like torture. Then, lo and behold the most fabulous view of stunning hills and sea. It was enough to keep you going, especially as you got to glimpse Kenepuru Sound for the first time, it’s water colour quite different to Queen Charlotte Sound. However, there are periods on this part of the track, particularly on the Kenepuru Sound side where you are exposed to the elements, in our case full sunshine. As I mentioned, I am not the fittest, and the ideas that ladies don’t sweat were truly thwarted that day. Even my eyelids felt like they could provide faries with a lovely salt spa pool! The refreshment of walking into native forest was immediate – the lovely, slightly damp, shade had an immediate impact on my energy levels and those of Mr Fitness himself, the Kiwi. By the time we got to Black Rock campsite I was feeling sore, tired and seriously questioning what on earth I was doing! Meanwhile, there was a lovely view down the Sound to Picton. We were almost on the downward path and it did take considerable effort – and a caramel slice – to get me going. We finally made it to Portage around 6.30pm. That was a well deserved long, hot shower that night! The following day was a rest day, we slept in, had a relaxed breakfast then wandered down to the Peppers resort and hired a double kayak and went out on the Sound for a bit then just chilled out and read. We had dinner at the restaurant, watching the sun set over the Sound. Food was good if a little over priced. I did mention that my dessert had clumps of gelatine in it and even had a lump on the plate for the Chef to see, and I feel if I’d mentioned this in Wellington it would have come off the bill but not in Portage. No competition. On day three we were only walking for a short distance, as we were heading to Lochmara Lodge in Lochmara Bay. We realised we should have walked this the day before, then had a rest day at Lochmara Lodge instead, however we now know for next time! It took us just over 3 hours to walk from Portage to Lochmara. The rest of the track is easier after that long 24.5k stretch, particularly the last day of walking from Lochmara Bay to Anakiwa. More gentle inclines and more meandering through forests. Since the majority of walkers start from Ship Cove you can feel a sense of splendid isolation as you quite often don’t meet other walkers, particularly on the long day as quite a few miss it out. By the time we were walking to Anakiwa on the last day the sound of traffic across the Sound travelling Queen Charlotte Drive seemed a rude imposter! We did meet quite a few walkers heading from Davies Bay up to the lookout, that stretch was quite busy. Mountain bikers can use the track, and all we came across were good at slowing down, giving way (although we gave way to them) and letting us know how many were coming behind them or part of their group. I am so glad we finally got around to this walk! It was beautiful, a little challenging at times but achievable and we got to see the Sounds in a different way. I hadn’t considered the Marlborough Sounds as a destination before, just some pretty scenery you pass on your way through. How wrong I was! I will be back for sure. If you feel committing to a number of days is too much out of your trip then try a day walk, which is absolutely achievable. Boats can drop you off at different bays and you can arrange a pick up too. Meanwhile, I feel rather smug I live in such a beautiful country! Love New Zealand! 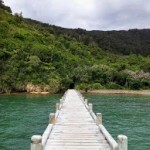 Tagged with Marlborough, Marlborough Sounds, New Zealand, NZ must do, Queen Charlotte Sound, Queen Charlotte Track, tramping, Travel, walking tracks.